Coming soon to a playground near you. It may be true that the heavily Auto-Tuned vocal sound jumped the shark about a year ago, but nobody's bothered to tell T-Pain. Not content with giving iOS users the opportunity to mimic his trademark robotic warble, he announced at last week's CES show that he's putting the technology into a $40 toy microphone. 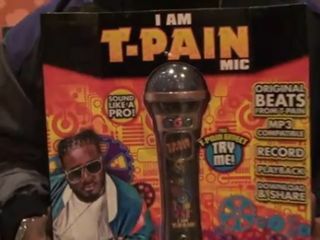 From the description we can see on the packaging, the I Am T-Pain Mic will feature beats by the singer and allow you to record yourself and listen back to the results. MP3 compatibility and a 'Download and Share' option are also featured, though we're not yet sure how these will work. The product is scheduled to ship worldwide in the summer.